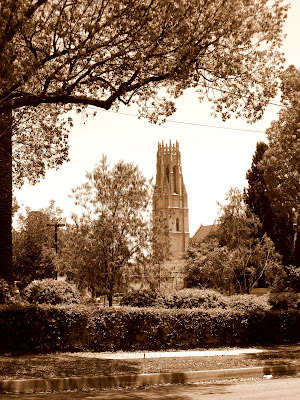 This is Westminster Presbyterian Church-- the back of it, anyways. Maxine and I were walking last Friday and took several pictures of it. It looks best in sepia, I think. Raquel stayed at her great-grandparents' house last week from Monday to Saturday. Poor Grandma! Not only is Raquel relentless with activity and conversation, which is more than enough for a great-grandma to handle, but also Grandpa was feeling ill the entire time Raquel was there. So Grandma had no help at all with Raquel and no time to herself either. Wow! She did say that Raquel was very well-behaved and of course taking care of a well-behaved child is tons easier than the alternative. This was Raquel's first time spending that many nights away from home and not to my surprise, she never got homesick. Jose, Maxine and I had a nice quiet week. To me, the peace was very refreshing. Thank you SO much, Grandma Emma. I found these sweet potato fries in the frozen food section at Target a few weeks ago and I'm hooked. They are healthy enough for me to eat and stay on my diet and I'm so glad because they are delicious. Maxine really enjoys them, too. It has to be this particular brand though because the other sweet potato fries are covered in an evil batter. These are innocent and plain. This is my second week of school and I'm so glad this class is only five weeks long. I highly prefer to do my own work but in this class we "pair up" or get into groups of three DAILY. I am against compromising the level of work I do for a grade but in groups you cannot avoid this. Being paired with people who cannot write in complete sentences quietly frustrates me. But the teacher did say last week that she does not grade on spelling and grammar and that she is only concerned with our critical reading skills. So, technically, it doesn't matter but it still REALLY GETS TO ME. How do you throw a party for your kids' birthdays, invite everyone you know and not get caught up in the stress of planning? If you know how, I am seriously asking! I feel like if things aren't perfect then I might as well not do them at all. There is no changing that about me. So I guess I'm probably doomed to feel this way every year around this time! And then when the party's over, I'll be fine. 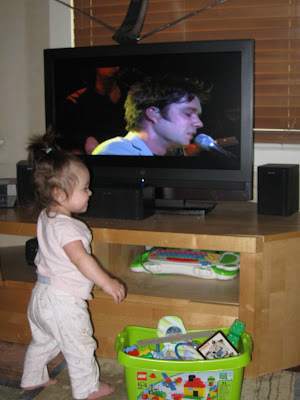 And here is a snapshot of Maxine dancing to her new favorite dvd, Rufus Wainwright at the Fillmore. Yep, she's got taste. I'm telling you she stares at him singing and it even calms her down when she's cranky. 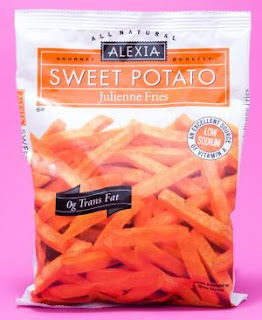 i had to say i really like those sweet potato fries---and sweet potatoes are good for you too! Fascinating shot of Westminster Cathreda! don't stress too much for the girl's party. you are so creative at everything i know it will be wonderful. i'm really hoping i'll feel up to going! i'm excited too our little ones will all be born in july!